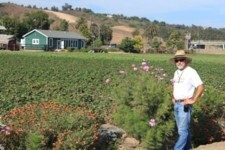 Farming on the coast of Southern California for 5 generations is the finest blessing this Irish American farm family could ever hope for- the deepest topsoil and the best climate produces an utopian garden farm. We are a sustainable farm that grows a high diversity of year-round organic fruits and vegetables for our community. Education is a priority at McGrath Family Farm. We hope to preserve our farmland through agricultural education, which we provide in all our farm tours. Please come visit our farm!